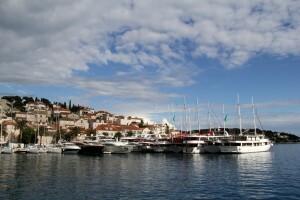 As I am typing this blog, we are about to enter Hvar for the third time! 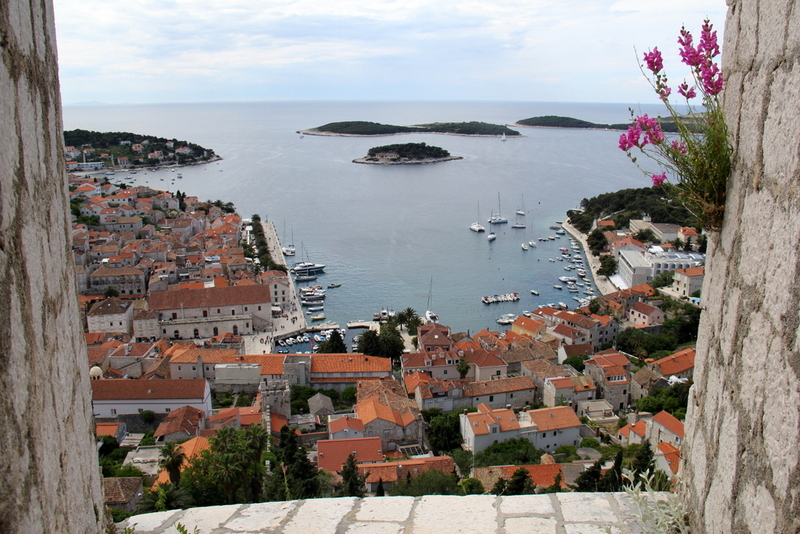 I will never get enough of Hvar! Again – it is just one of those places that carries so much history on it’s shoulders that it is almost an insult to try and describe the place in a few sentences! Arriving there was just breath taking. 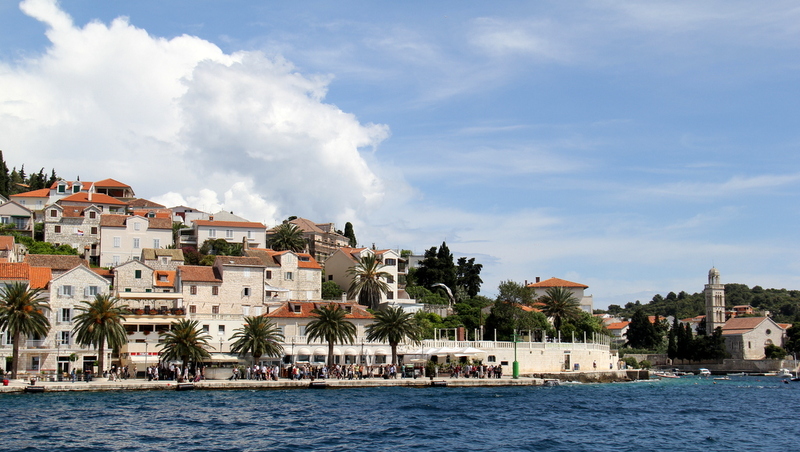 On the one side of the harbour is a long waterfront promenade strip, bordered with palm trees and beautiful old limestone buildings, staggered up on the hill with their red and brown tiled roofs and white and green shutters. The promenade is a line-up of inviting restaurants and coffee shops and makes for great people watching over a coffee or beer. Yachts are docked stern to on this town dock one next to the other and often a few really big ones too. By sunset the harbour is filled by tourist boats and gulets are often rafted up to 8 deep. Mixed with super yachts and smaller charter yachts. The one outstanding character of the islands on the Croatian coast is that they are very steep to and even the smallest bays or harbours provides deep enough waters for even the really big super yachts. 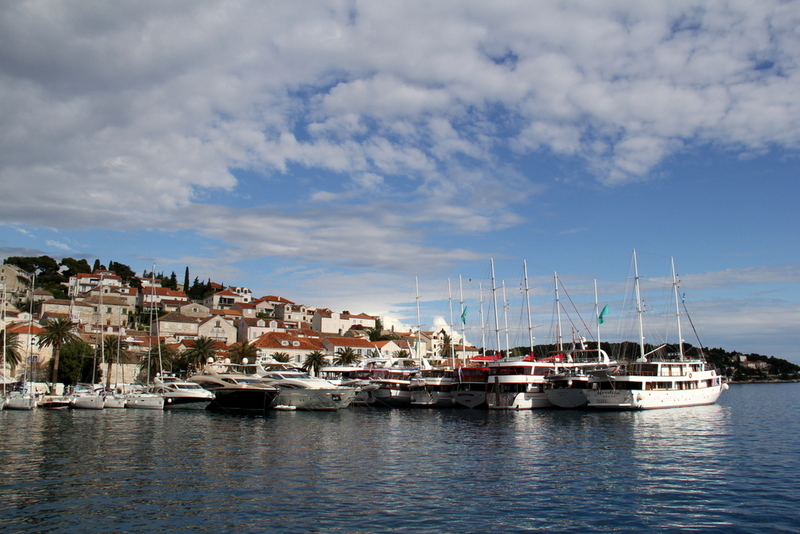 Hvar has a lot to offer to tourist and is one of the most popular islands of Croatia. The walk up to the fortress Fortica (Spanjola ) is a must. The fortress is the first to catch your eye, right on top of the hill overlooking the town’s harbour and surrounding islands! A fabulous view will reward the effort. Hvar is also known as the Lavender Island – Rosemary is also growing wild and in abundance! Everywhere you go something Lavender will be sold and it makes for a lovely purple display and bouquet at almost every stall! Unfortunately the lavender was not in bloom while we were there. The lavender in Hvar, the tulips in Holland and the Hydrangeas in the Azores are part of my next flower-chase-holiday!